A personal highlight of our vacation was being able to meet a blogging buddy of mine. We've been communicating back and forth with each other since January of 2008. We both have recently moved and built a house. Only she moved to a much more fun place - Orlando!!! After she moved, we continued to talk and she gave us some good advice about planning our trip to Disney World. I would consider her and expert on all things Disney! Also, she got on the Twilight bandwagon and we were able to discuss all the wonderful things about the books and the movie. and see her perspective on our visit together. 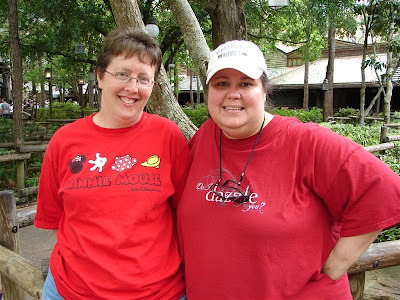 Karen - it was a joy to meet you and hope we continue to be blogging buddies for years to come! !